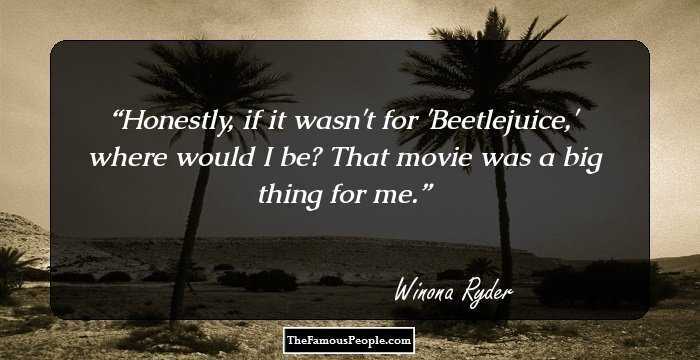 A collection of awesome quotes and sayings by Winona Ryder on life, money, aging, peace, work, love, character etc. Winona Ryder wanted to be just a normal girl, flirting with a normal guy. Instead, she became an iconic star, whom “weird people follow” on the street and who “can’t sit alone in a restaurant or a café and read a book in peace”. In her long acting career, Ryder has accumulated a huge cache of experiences and in interviews she has talked about them freely, acknowledging that she has been blessed with good and supportive friends. 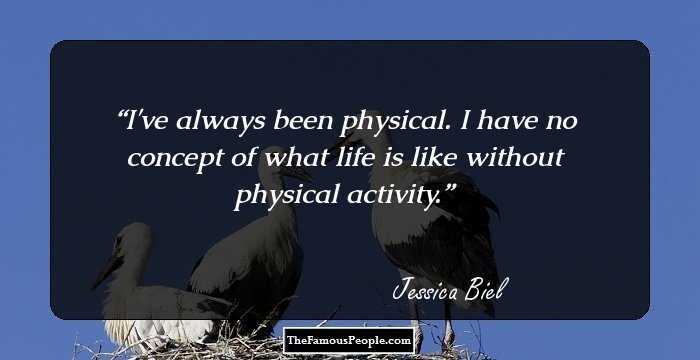 Let us now take a look at some of her notable quotes, in which she has not only talked about her life; but also on various subjects like finding good roles, her love for books, marriage and divorce, motherhood, aging and dressing. 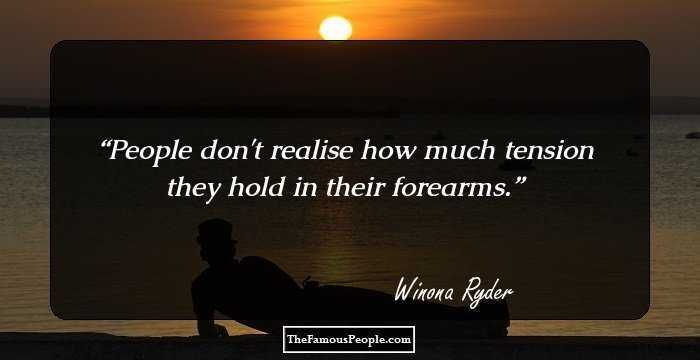 People don't realise how much tension they hold in their forearms. 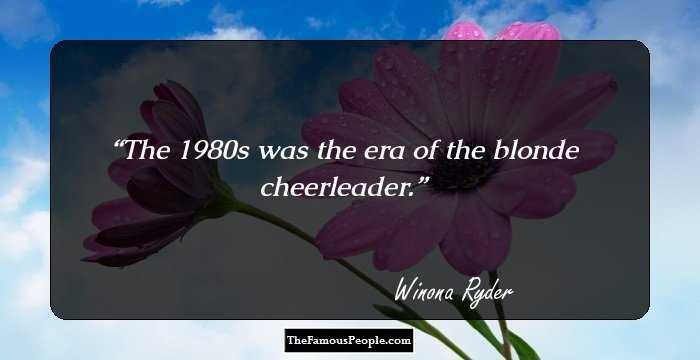 The 1980s was the era of the blonde cheerleader. 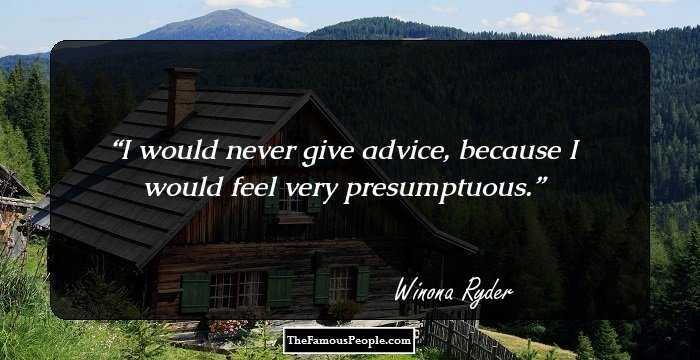 I would never give advice, because I would feel very presumptuous. Honestly, if it wasn't for 'Beetlejuice,' where would I be? That movie was a big thing for me. I was unusual looking - I didn't have the look of that time. 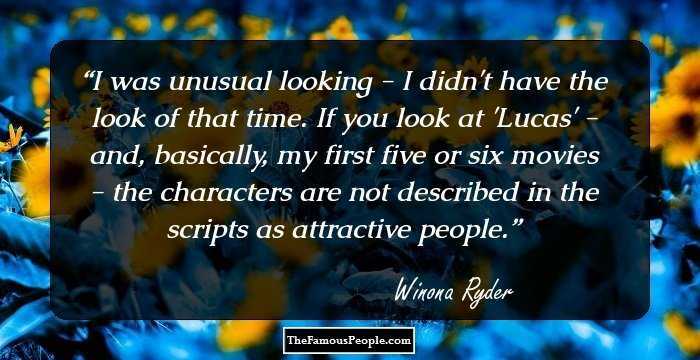 If you look at 'Lucas' - and, basically, my first five or six movies - the characters are not described in the scripts as attractive people. I feel a little stronger than people perceive me. My problems seemed so glamorous to other people, and everyone just thought I was so lucky. But then, I was lucky because my family was really there for me - San Francisco was a real refuge. I approached work very seriously. I never went out. I couldn't fathom people who could go out to clubs... I mean, if I had a 6 A.M. call, I had to be prepared. I had to be in bed at a certain hour. Even though I never really had to pound the pavement as an actor, I always worked really hard. But, at the same time, I always felt like people thought that I didn't have to struggle even though I was struggling. I don't have a director's mind. I'm part of the crew obsessed with 'The Wire.' Like, I'm not over that yet. In real life, and for women everywhere, no matter what their job is, your 30s and your 40s and beyond should be celebrated. As a teenager, I worked on Indian reservations, and it was such an incredible culture: the elders are so respected. My favourite performances are by actresses like Bette Davis in 'All About Eve' or Gena Rowlands in pretty much anything - performances that have nothing to do with age. It was hard to find that transition to adult roles. There are certain directors who will start talking to you about something, and suddenly you'll be ready to roll, and you'll realize it was very specific. The Duffers can be super articulate or very straight to the point. I was really impressed with how they were with each other. Usually, the roles that you get offered that are the mom roles are very much the mom role. Some people go to L.A. just to see recognizable people. There are tour buses. But in New York, everyone seems a little less into that. I'm just coming from a more personal - and, I guess, more nostalgic - point of view. My home is San Francisco - that is definitely what I consider my home. I've always been super-private and protective of certain experiences and certain friends. One of my worst fears is being a self-indulgent person. I did 'Beetlejuice,' and it was a big movie, but it didn't help my high-school experience. In fact, it made it worse. I was a freak and a witch. I would not want to go back to playing the ingenue. I'm not someone like Norma Desmond who's harking back to her younger days. I did this little movie I really love called 'Experimenter,' but that took six years to get made and no money. I binge-watched this show 'Damages.' Glenn Close and Rose Byrne are so good. Lily Tomlin is in it. You see all these great actors, and the writing is terrific. 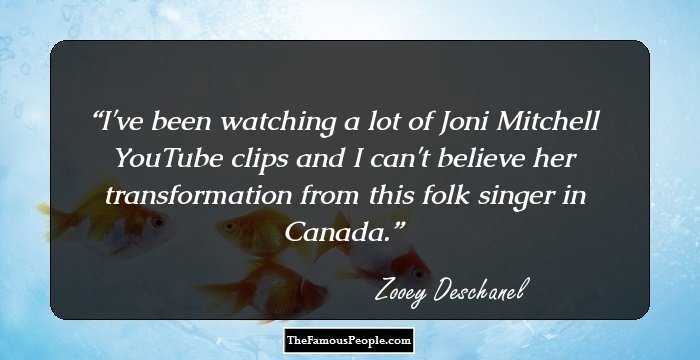 There are a lot of shows like that. I just did what I found interesting. I was so lucky that I was able to do that, especially in the '90s. I was really able to have a life to go back to. It's interesting because, even with 'Beetlejuice,' I was an awkward kid. I started at puberty and went through it on film. Lydia was one of my favorite roles because I related to her a lot. On the set for 'Beetlejuice,' it was before people would go watch on monitors, and directors would be next to the camera. With 'Ed Wood,' I sobbed. With 'Frankenweenie,' I was crying. With 'Edward Scissorhands,' I always cry. There's always an incredible amount of purity, even if they look a certain way. I can see it in even great actors' performances, when they're phoning it in. There's a couple of times that I did it for the... paycheck. Even when I was younger - I remember I did this movie that wasn't good, called '1969.' I totally did it 'cause I could get out of school. I have my email on my Blackberry, and that's about it. It's great concentrating so hard you feel your brain will explode. When I'm acting well, it's the most exhilarating experience. When I'm bad, it's miserable. When I was young, I was the sweetheart of the press. They loved me but were kind of waiting for me to mess up. I had no skeletons in my closet, no major past to talk about. I'm used to being told what to say, but not what to think... that's usually left up to me. Apparently, Bette Davis and a lot of actresses had a hard time in their 30s, too. I love watching old movies, and I read a lot of autobiographies. I get sent a lot of scripts where you're just the mom. I'm so sick of people shaming women for being sensitive or vulnerable. It's so bizarre to me... I do have those qualities, and I just don't think there's anything wrong with them. I was fired from a movie because I did 'Heathers!' I was cast in a movie, and the director saw an advance screening and was offended by it and fired me. It's all about knowing when to listen to that conversation and - without sounding really hokey - when to tune it out and follow your heart. It used to be that you commit to something, and then basically you spend your year doing that. Now there's a constant conversation of how you have to keep working in order to remind people that you're around. You have to work to be relevant. If you don't, then people will forget, and the studios won't want you because they won't remember the last thing you did that made money. I was single for a while and dating and... I just didn't know how to do it! I've always been like that: when I was 15, there was a guy I liked, and we made out, and I thought that meant he was my boyfriend. Googling yourself is maybe one of the worst things you can do. I did it once, and someone had to talk me off a ledge. I feel like I had to learn how to take care of myself and find out what made me happy aside from just making films. I am not a person who can really sit around and think about regrets because with every bad experience that you have, there is weirdly something good that comes from it. I love photography and first editions. 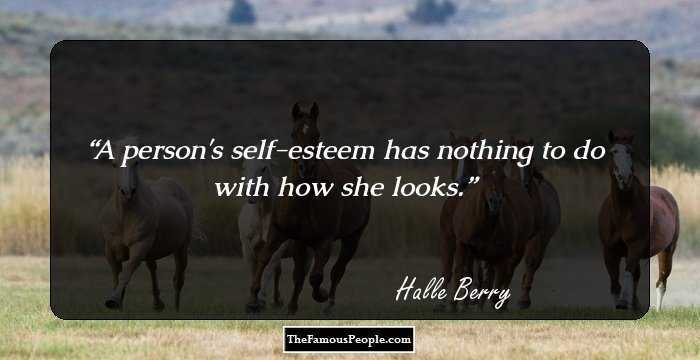 I have that in my genes. My father was an archivist. I would love to someday do a play. I did one when I was very young in San Francisco, where I grew up. A girl can dream. It's equally as important to me to be a good friend and a good sister and a good daughter. I'm very close with my family and friends. I'm not interested in playing the girl that's just there to make the guy, you know, give him a talking to. Even though 'Heathers' didn't make a lot of money, I really was able to transition into a situation where people thought I could play an attractive role because of it. I loved movies, but I can't remember ever really wanting to be an actress, and I certainly didn't imagine ever being in a movie. I think I wanted to be a writer. I've learned that it's OK to be flawed, that life can be messy, that some days you glide and some days you fall, but most important, that there are no secret answers out there. I think I really scored with my parents. All of my friends pretty much came from broken homes, and my parents are still together, but not only that, they're still in love and still write together. My parents are awesome, but they're pretty left-wing. You have good days and bad days, and depression's something that, you know, is always with you. I love books and going to bookstores. My favorite sound is the sound of the needle hitting the record. A woman who wears high heels is very different, I think, than a woman who wears sandals. I don't want to preach, and I don't want to tell people what to do. For a long time, I was almost ashamed of being an actress. I felt like it was a shallow occupation. People would be watching my every move. I write pretty much every day, but I don't have any desire to publish anything. I thought it was a cool parallel. Being replaced by the young thing. I know that definitely happens in Hollywood. It's harder to find good roles, and suddenly there's new girls. I'm at that age I've been warned my whole life about. As an actress, you want to try new things. You don't want to repeat yourself. 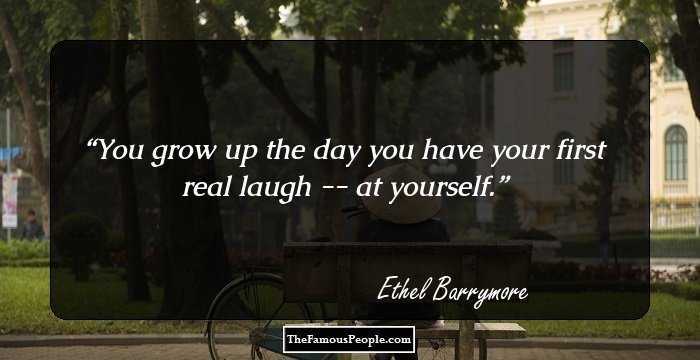 That becomes more important to you, as you get older. I remember when I first started being in magazines, I had pretty thin skin. I was this nerd that read books and stayed home and didn't go out. I'd always find the positive in someone. I don't use the Internet, but apparently you can find out everything on it. I remember the whole thing with the word ambition. I was messed up for a while because I associated it with certain people who just want to be famous. I think, for a while, it was kind of a dirty word for women. As an actress, you go where the stories are. I don't really care where it's seen, at this point. I just want to tell good stories and do good roles that I haven't done before.